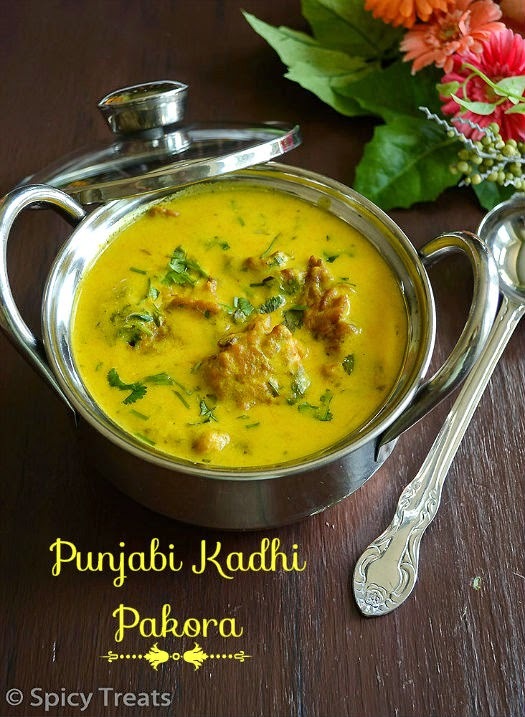 Spicy Treats: Punjabi Kadhi Pakora / Punjabi Kadhi With Pakora ~ Punjabi Recipes!! 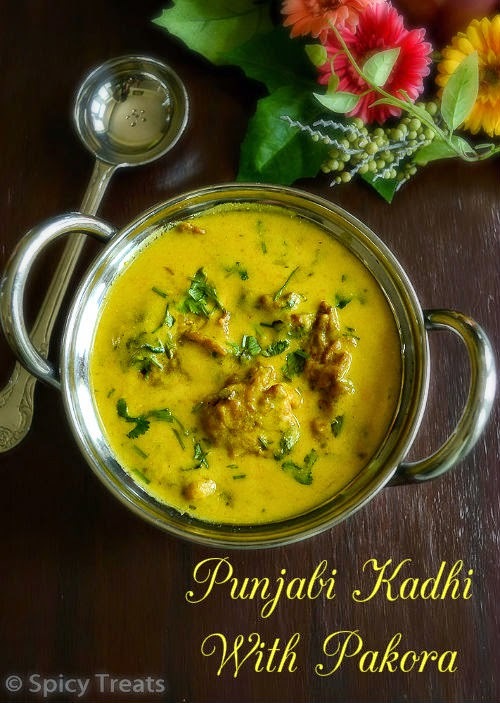 Today's post is an Authentic Punjabi Kadhi recipe / Punjabi Kadhi Pakora recipe which i learnt from my Neighbor Aunt. After moving to Aurora, we are happy to have two Indian Neighbors. And the two families were so kind, caring and helping people. Really its blessed to have such people around us. I am lucky to have such people around me after 3 years. Yes.,for the past 3 years we don't have any Indian neighbors. One of the neighbor family is from Punjab and the other family is from Himachal Pradesh. So you can expect more recipes from punjab & Himachal Cuisine soon. This Punjabi Kadhi is not cooked by me and it was prepared by my neighbor Aunt. One fine day talking to Aunt, i asked for the kadhi recipe and she said tomorrow i am planning to make kadhi for guest than will give it to you. I said No, that i want the recipe for my blog and I myself asked her that shall i come tomorrow to take the pictures of kadhi making. Without a second thought, she said ok and the next day she called me after preparing the stuffs ready for kadhi making. I went and took pictures at their house. She helped me a lot and i enjoyed cooking this recipe with her. First fry pakora and keep aside. For that, in a bowl mix all the ingredients for Pakora and keep ready. Then heat oil in a kadai, when its hot, turn the heat to medium and using a spoon drop a small portion of pakora into the oil and deep fry till it turns golden brown and crisp. Once done transfer to a paper towel and keep aside. Then Mix yogurt and besan flour to a lump free batter and add water mix well and keep aside. Now for kadi, heat oil in a kadai when its heated add methi seeds and cumin seeds allow to splutter. Then add crushed garlic and fry well. After that add few sliced onions, finely chopped ginger and saute till onion turns golden brown. And then add turmeric powder, chilli powder, salt and few sliced potato(if desired) and stir fry for 1-2 minutes. Now add the yogurt-besan mixture, stir well and bring it to boil. Keep constant stirring to avoid lumps and burnt at the bottom. Kadhi should be cooked for minimun 20-25 minutes in medium heat. 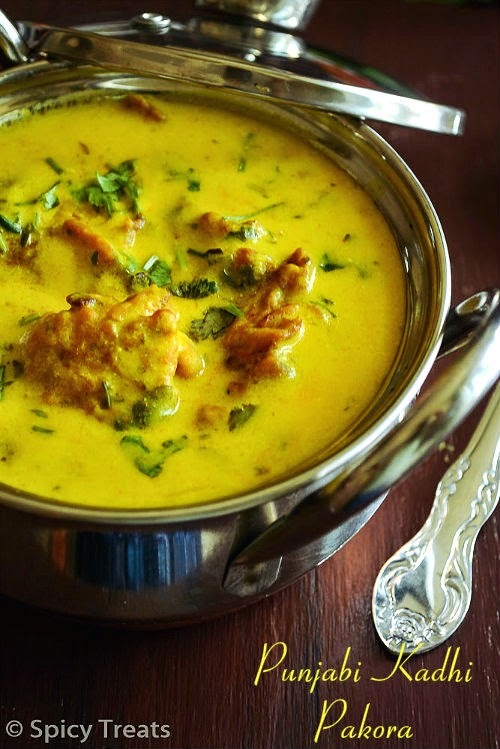 Once kadhi boiled well and raw smell leaves add the fried pakora stir gently and simmer for 2 minutes. Finally add some chopped curry leaves and cilantro and switch off the stove. That's it..Punjabi Kadhi Pakora ready. Serve with hot plain rice or Jeera Rice. Adding potato to the kadhi and pakora is optional, if you don't like potato you can skip it very well. Adjust water to your desired consistency, and also before set to boil make the kadhi little thin, so upon boiling it tend to thicken slightly. Instead of onion pakora you can also make lauke pakora/bottle gourd pakora, peel and shred bottle gourd and mix it with besan. loved reading this post and about your sweet neighbors :) You are too lucky to be around such neighbors sangee .. and convey to your neighbor anut kadhi looks so tempting and perfect punjabi style :) Making me hungry !! lovely clicks by you !! Nice clicks. 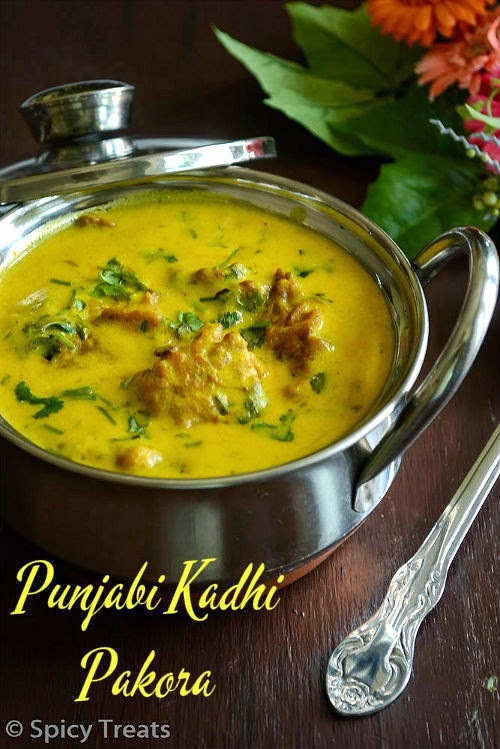 Kadhi looks inviting and delicious. perfect.. very tempting my fav too. u hv good neighbors.. The Punjabi Curry looks so inviting. Perfectly made curry dear. Lovely clicks dear, kadhi looks very tempting, nice neighbors mean a lot..
Lovely presentation, lucky you to have nice neighbors... hope to see more Punjabi recipes! I was searching for a kadhi with pakora recipe and came across your blog. 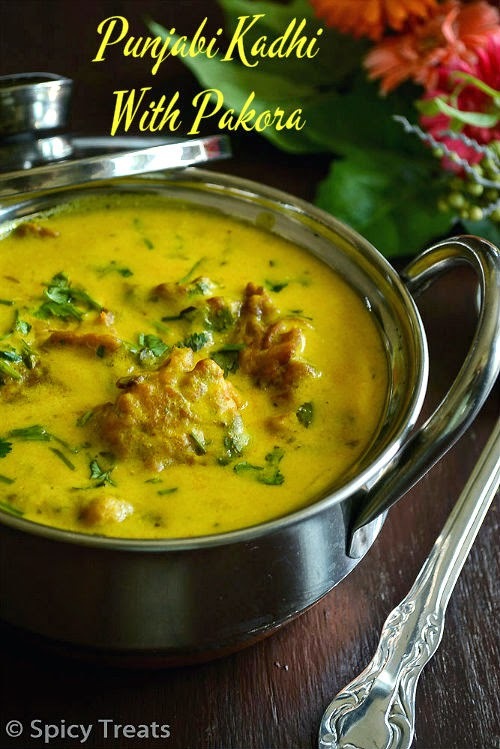 The kadhi looks fantastic and I will try it out soon. I've only seen a couple of posts so far, but I love it. I can wait to read more.